Allrounder Remodeling Awards Scholarship to 2018 Simley Graduate – Allrounder Remodeling Inc.
Part of our Core Values is giving back to our community where we live and work. In addition, our industry is suffering from a lack of young people joining the rewarding and fun careers that we participate in each day. 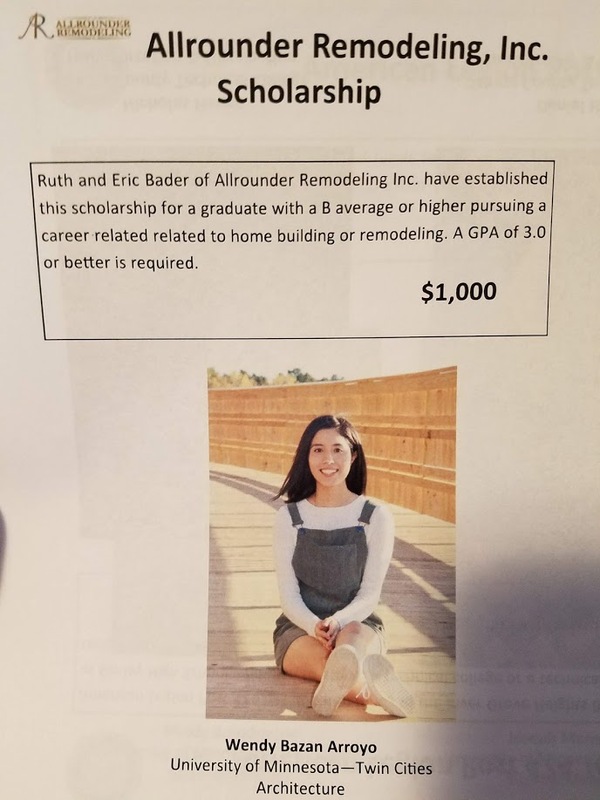 In an effort to give back to our community and bolster our own industry, we have developed a yearly scholarship for a Simley High School Graduate who plans to attend a post secondary school or apprenticeship program with the intention of learning a trade related to home building or remodeling. In order to qualify, students must maintain a B grade average, participate in community service, and provide letters of recommendation from teachers or community leaders. Our scholarship is administered by the hard working folks at the Inver Grove Heights BEST Foundation. They work tirelessly to find a student who meets the requirements that we set forth when developing the scholarship. This year, we were pleased to be able to present our scholarship to a young lady who dreams of being an architect. If you know a student who will be graduating in the coming years from Simley High School, please encourage him or her to apply for these scholarships.